Colic, or Gastroesophageal Reflux is when a baby goes through a period of excessive and unexplained crying that is often accompanied by body arching and an inability to be soothed. This can be a very stressful time for parents as they do not know what to do to help their baby. We see a lot of babies in our office with colic/reflux and in this article we want to talk about 3 things that you will not hear from your pediatrician about colic/reflux. 1. Colic/Reflux can often be a sign of neurological stress. A lot of people just associate colic and reflux with digestive issues. While this can often be true, it can also be a sign that there is stress on the baby’s nervous system. Our nervous system controls our digestive system and the musculature of the digestive system. When there is stress on the nervous system, the body often goes into protection mode. When in protection mode, the muscles of the body often tense up. That muscular tension can then lead to symptoms like colic/reflux. Most pediatricians will tell parents that their child will eventually grow out of the colic/reflux. While symptomatically this may be true, the symptoms often disappear by 6 to 8 months old. If the colic/reflux is due to neurological stress, the underlying problem remains. 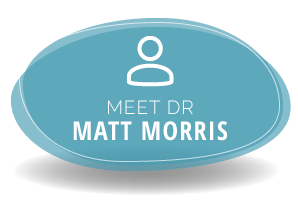 We have taken hundreds of case histories in our office and what we find is that colic/reflux due to neurological stress turns into other chronic challenges later in development. The common trajectory we see is colic/reflux as an infant, chronic immune challenges like ear/sinus/throat infections as toddlers, and then sensory/ADHD/spectrum challenges when they reach 3 to 5 years old. 3. Pediatric chiropractic can help! Most pediatricians will tell you that pediatric chiropractic is very dangerous for an infant. 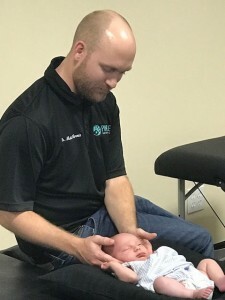 Pediatric chiropractic is very different than the traditional chiropractic that you and your pediatrician may be familiar with. The force used in a pediatric adjustment is the amount of pressure used to check the ripeness of a tomato or avocado. It is VERY gentle and non-invasive. You might of heard a friend or family member tell you that they took their colicky/refluxy child to a pediatric chiropractor and it helped. As a pediatric chiropractor, we see a very high success rate with babies with colic/reflux in our office. 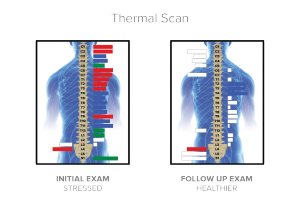 We also use state of the art technology to measure stress and inflammation on the nervous system. These “scans” are non-invasive and do not emit any radiation or harmful energies. Our true goal is to remove stress on the nervous system and allow the body to function properly. Our office is around 90% pediatrics so we have a ton of experience working with children of all ages. We see children with colic/reflux, chronic immune challenges, autism, ADHD, and Sensory challenges! If you are interested in learning more, give our office a call at 941-822-8828. We would love to help!